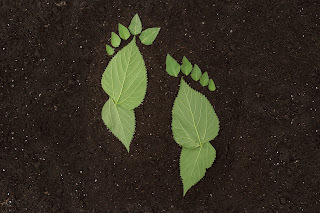 In honor of Earth Day, coming up soon, we are working hard to cut our carbon footprint. Would you like to join us? Here are a few ways we can all work together to reduce our carbon footprint-- not just on Earth Day, but every day! If you live within a reasonable distance of your job, try riding your bicycle or walking to work! If you don’t live close enough, make it a weekend thing! Try biking to the grocery store or to a nearby park to get some outdoor time. We lived in a “plugged in” world. Try cutting down on plug in time and turning off electronics for a few hours a day. Pick up a book in the evening instead of turning on the TV. Turn off lights when you aren’t in the room. Lighting with candles saves energy and sets a romantic and relaxing mood for any evening! Try to get as much as possible done in the shower, such as brushing your teeth. This reduces wasted water you’d generally run in the sink. Try turning your shower head on while rinsing and leaving it off while brushing and washing. Head over to your local farmers market for your next grocery haul! This will cut down on buying unneeded packaged goods and cut down on plastic use. Plus, you’ll be supporting local farmers! Happy Earth Day! Who’s up for joining us?